Ended up anchoring up in less then 30 ft on a reef patch. Dropped the chum bag and immediately started catching yellowtail, short grouper, porgies, mutton snapper and a few sharks. Fished the Incoming tide from 8-10:30 am. 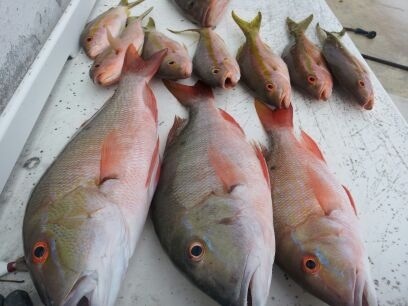 The fish box claimed a total of 3 keeper muttons to 21", 1 red grouper at 22", and the remainder of my yellowtail snapper measuring to 16". Nice day despite the nasty wind conditions! Well done and good eats! Nice :fishing thanks for the report. 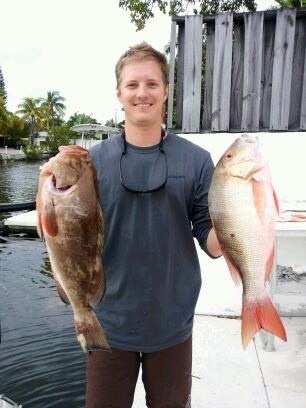 That is awesome, glad u nailed a keeper grouper on the last day of the season! I was not able to accomplish that this past week, too many shorts unfortunately.